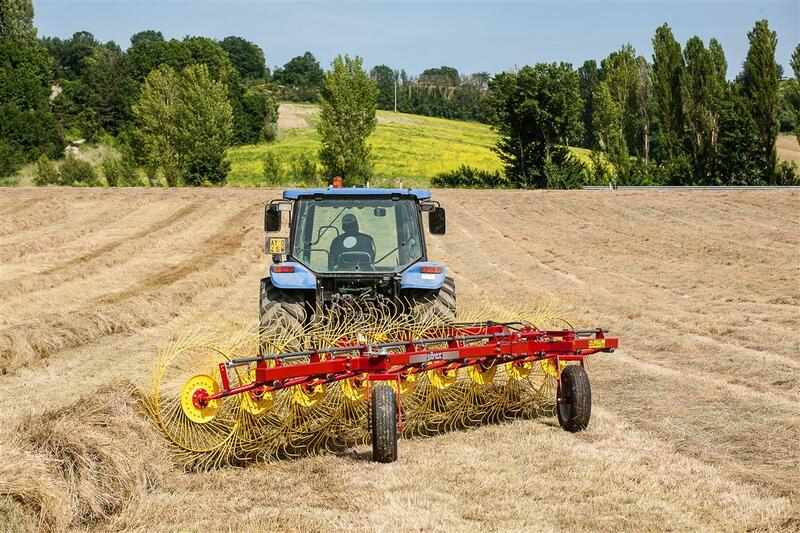 The new range of TR-S in-line trailed wheel rakes stands out from the traditional earlier range for its smaller transport dimensions and for being extremely easy to use and to adjust while working. 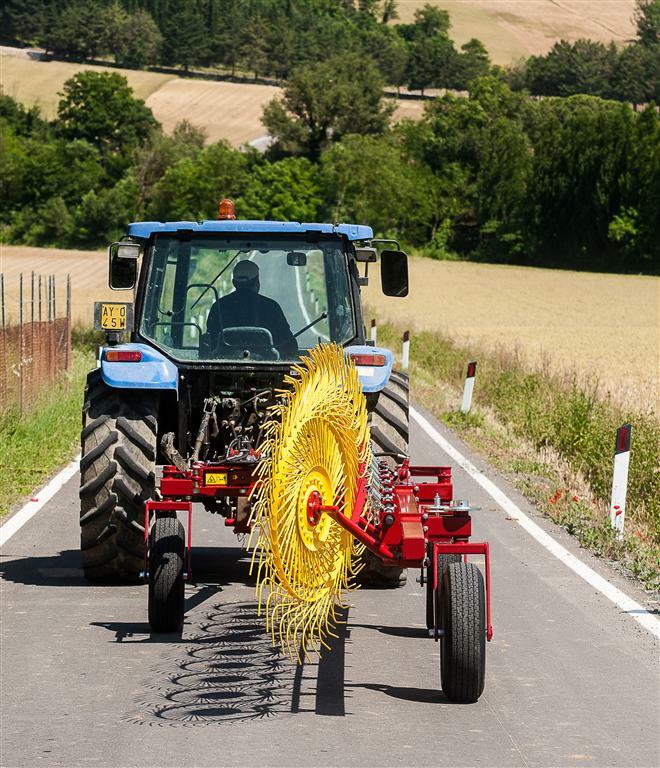 The machine can be moved from the transport to the working position and back to the transport position from the tractor, using the hydraulic system. The machine’s sturdy design provides excellent performance both in terms of quantity and quality. The TR-S range is supplied standard with three wheels, and has great maneuverability in small spaces and on uneven surfaces, and great stability both while working and during transport. 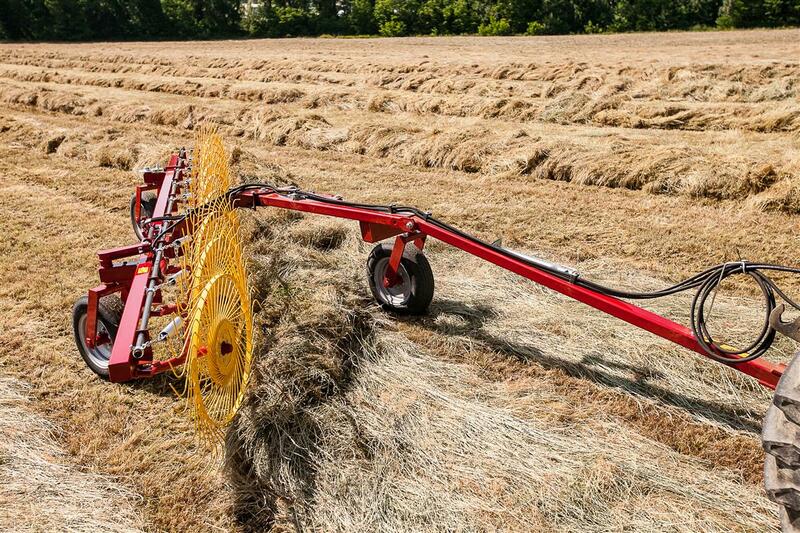 The TR-S range has a strong, suitably jointed structure, guaranteeing long machine life even under heavy use. The machine can be brought from the transport position to the working position (and vice versa) by simply moving a hydraulic control from the tractor cab. This is because the machine is equipped with a joint system that makes it possible to minimize the overall dimensions of the machine during transport and to be able to constantly adjust the working width, adapting it to your needs. Block valves on the opening and closing cylinders allow you to transport the machine safely and to maintain the same working width while raking. 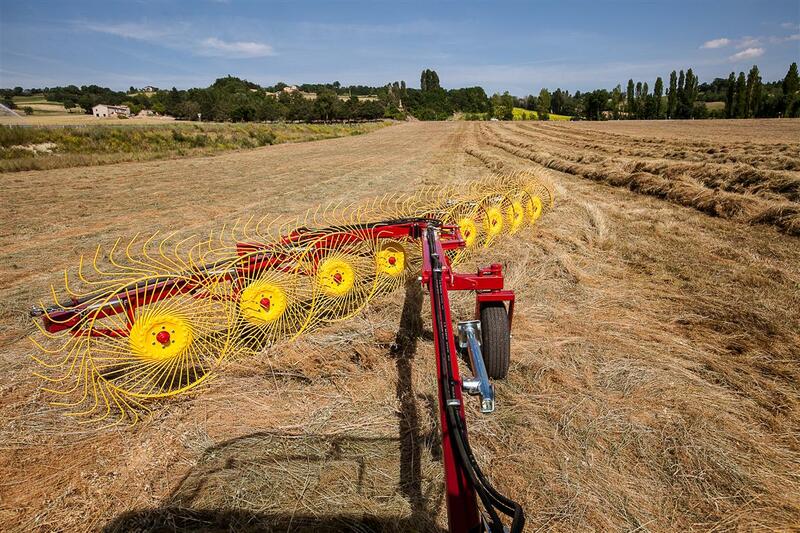 A spring on each rake arm enables the rake wheels to adapt to even the most uneven terrain at all times, thus always guaranteeing top raking performance. This system also protects the machine against the stress that would otherwise be transmitted by the rake wheels while working and especially if they strike some obstacle. These features make it possible to obtain performance of the highest quality from every point of view. Transport height (B) 1,7m / 67"
Transport width (C) 1,95m / 77"
Tines diam. 7mm / 0.3"
Wheel diam. 1,4m / 55"
Raking working width 4m / 13'2"
Overall length (A) 7,95m / 23'4"
Raking working width 4,5m / 14'9"
Overall length (A) 8,75m / 26'3"
Raking working width 5m / 16'5"
Overall length (A) 9,65m / 31'6"
Overall length (A) 10,3m / 33'8"
Transport height (B) 1,750m / 68,9"
Transport width (C) 2,48 / 97,6"
Raking working width 6,5m / 21'3"
Raking working width 7,5m / 24'7"